Today, a short tutorial in how to add a logo to the themes used for the template sites. In this tutorial you'll learn how to do some basic CSS customization to add your own logo to a Wikidot site. I assume you're using one of the Rainbow themes but the instructions are easy to adapt to other themes. Making a custom logo is a great way to learn to do CSS customization. Before you start, here is a tip for CSS customization. Install the FireFox browser if you don't already use it, and then the Firebug addon. This makes it really easy to try CSS changes and learn the structure of your site's layout. Step one is to make a site to experiment with. Go to the Iron Giant default template, click 'Clone this site', and create a new site. You can delete this site afterwards, or use it as a basis for your own new sites. The logo is a PNG image (it could be a jpeg but those carry a risk of compression artifacts). We'll put the logo image above the menu bar, in place of the site title. All pages will immediately show the logo and we'll make it blend nicely with the background. We will add custom CSS after that @import line. Add these lines after the @import line, and refresh the page. Your site's title and description should disappear. Step four is to upload to your example site's admin:themes page. To upload a file, find the 'Files' link, choose a file and then upload it. This gives you a URL /local—files/admin:themes/mylogo.png. Step five is to display the logo. We'll use the #header-extra-div-1 entity, which is empty in standard themes. You can resize and move this entity anywhere within the header. If you are unsure of how this entity fits into the page CSS structure, use Firebug. So, to finish the tutorial, edit your custom CSS to add that code. The width and height can be anything, so long as they are large enough for the logo. The division starts at the very top of the page, since that is where our shaded background must sit. That's it! 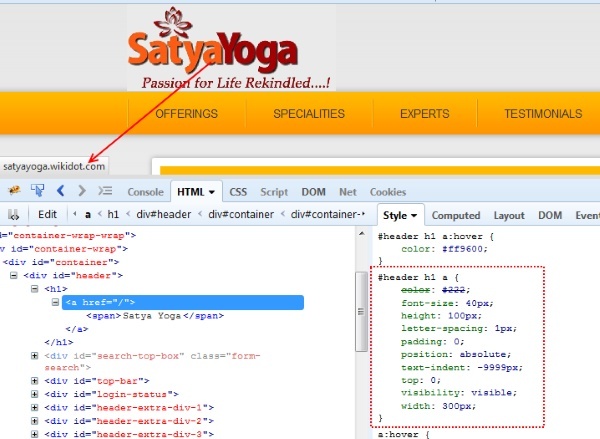 The technique should work on any stylesheet that does not already use the #header-extra-div-1 entity. What is an "extensible logo/banner" ? Example: orange juice //grabs 95% of the screen width, up to 1200 pixels wide. The banner header logo should be able to grow / decrease with the actual width of the browser's screen/window. Usually it is composed of a left part and of a right part which overlaps the left part. Ask Squark, he should know what I'm talking about. Although I haven't investigated this in detail I did achieve something similar with my header for Stacey's site at http://southwestimagebank.org/. The header image does expand and contract with the liquid layout, although if the screen gets a lot smaller you start to lose the left and right edges of the image. How do I link the header image to a url (typically, the site address itself)? Re: How do I link? You've put the image into the #header-extra-div-1 rule as this tutorial says, but by doing that you won't be able to link it to anything. The main image on a site is normally put as a background to the #header rule. To have the image link to your start page you need to use a combination of the #header, #header h1 and #header h1 a rules. The link is actually applied to the site title text but with the text-indent we've moved the text completely out of the way while leaving the actual link intact.